I am the only one at my house who will eat asparagus! I love it but I never used to buy it often because I didn't want it to go to waste. But I've figured out a few things to do with the leftovers that make having extra a really good thing! And this asparagus only takes a few minutes to prepare so it’s a great veggie to cook when your time is limited. Peel garlic and smash with a chef’s knife or spatula so that the cloves burst open but mostly stay intact. Heat olive oil and garlic in a medium skillet over medium-high heat until garlic is fragrant and just starting to brown (about 2-3 minutes). Remove garlic from oil. We do this to infuse the oil with the garlic without worrying about the garlic overcooking and becoming bitter. Remove garlic and discard. Cut the fibrous ends off of the asparagus. I pick one piece up and see where the end naturally snaps off when I bend it then use it as sort of a template to know how much to cut off of the other pieces. 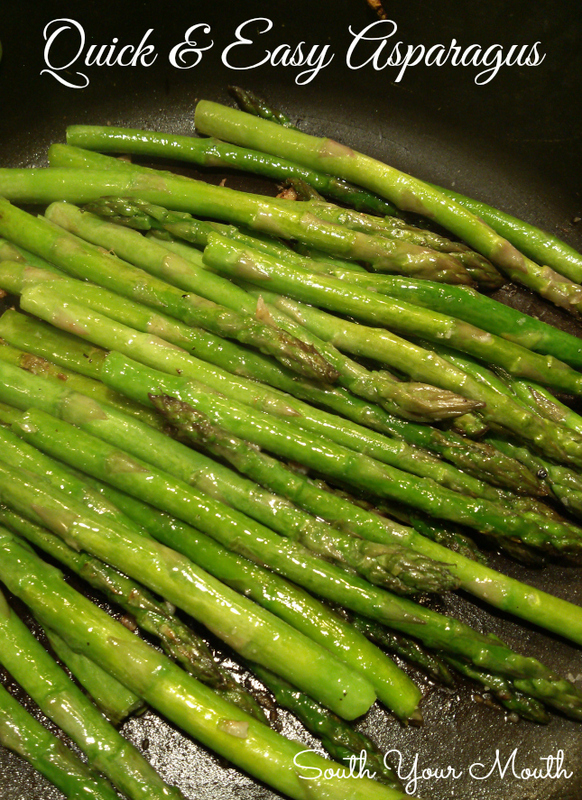 Add the asparagus and salt to taste to the oil and sauté for 3-4 minutes or until tender-crisp. Serve immediately. Sounds good! I like the idea of the added garlic flavor. To be honest, I just wash and trim my asparagus and lay it in a glass pie plate with about a tablespoon of water in the bottom. Cover it with plastic wrap and nuke it on high for two or three minutes (Cook it longer if you like your asparagus softer.) If I'm planning to use it cold--say in a veggie tray--I'll blanch it in cold water and ice to keep the color vibrant. If I'm planning to use it hot it gets served. This is a really nice and simple recipe. I normally steam my asparagus. But when I want to up the ante, this is it. Ever thought of trying this with bacon? I slowly render 4-5 bacon strips that have been diced. When that’s almost done, I add about 1/3 c. of diced onion to the pan. Meanwhile I blanch the asparagus for 2-3 min., then into an ice bath. I cut the asparagus into 1 in. pieces and then add them back into the pan to finish them off. It’s pretty good. But then-again, bacon makes everything taste good. I am going to try this one! I usually steam and then add lime juice, butter and salt. Also cook it on the grill by putting asparagus, ice cubes, a lime. Squeeze the lime over the asparagus and toss the rest of the lime on top of the asparagus. Great in stir fry too! My favourite basic asparagus recipe is to lay out a bunch or two of trimmed asparagus stems and add either a dob of real butter or a light drizzle of extra virgin olive oil in a shallow aluminium foil 'dish' and place this on a grill tray. Briefly place under the grill to open the asparagus cells a bit then pour over a sprinkling to taste of lemon juice then close the aluminium foil tightly over it and place back under the grill until it is lightly cooked so that there is still some resistance to the bite. If I am eating it by myself ( or if my dining companions like it, too ) I will also add a twist or few of freshly ground black pepper at the first step.